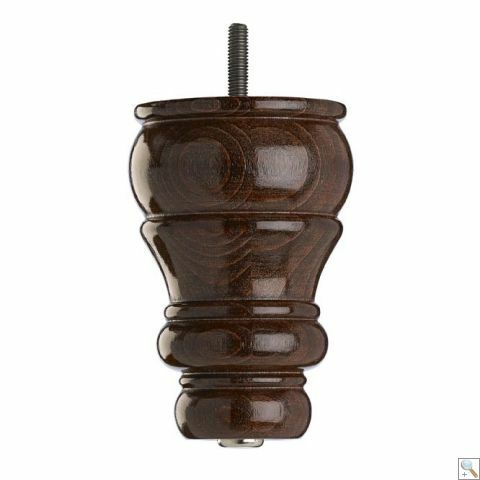 Sofa Feet for Couches 115mm Square Mahogany finish for chairs and sofa's from Furnacc NZ. Height 70mm, 115mm x 115mm tapered. Top quality solid European Beech timber. 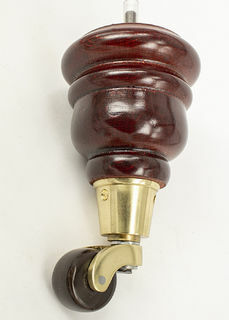 First class Mahogany finish. Contemporary SQUARE wooden sofa leg suitable for lounge suite chairs and sofas. Timber is tight grained European Beech coated with a durable gloss MAHOGANY stain. Height is 70mm including the 3mm x 18mm chrome plated dome on the base. As well as being square shaped this leg is also shaped & tapered on all four faces. The taper is from 115mm x 115mm at the top to 70mm x 70mm at the floor. 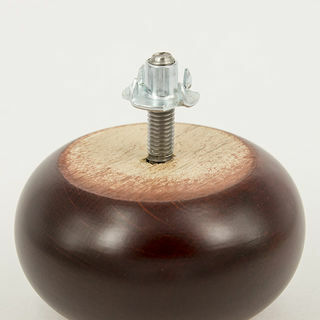 Fitting is by threaded bolt already inserted through the centre of the wooden foot. The thread diameter of the bolt is Metric 8mm (M8) and is 30mm long. 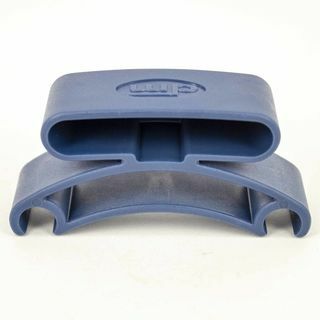 An Insert Nut M8 x 22.5mm is included with each leg supplied. This is the strongest fitting available for New Zealand soft timber frames. The drill size for the wooden frame to fit these 8mm Insert Screws is 9.5mm and the hole should be at least 32mm deep to permit clearance of the threaded bolt inside the frame. The Insert Screw is wound into the prepared hole by use of an 8mm diameter Allen Key. 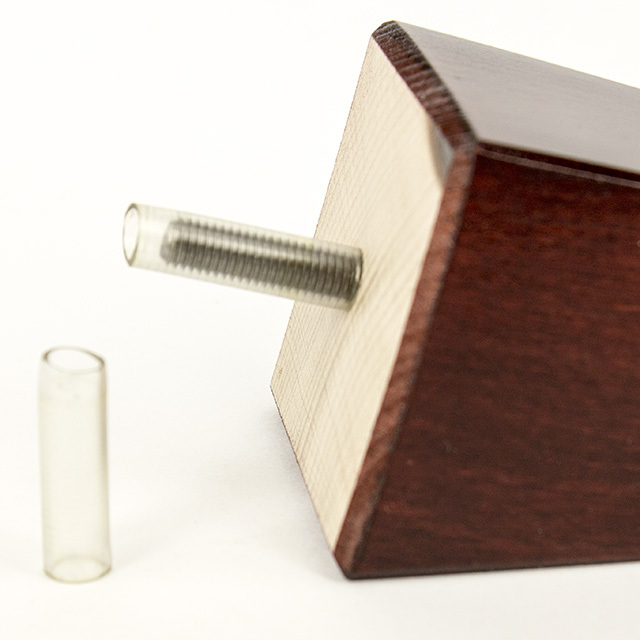 The threaded bolt should then be easily wound into the fitted Insert Screw for a secure and stable result. 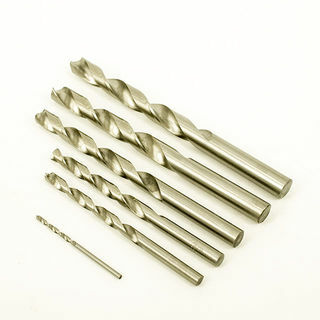 Suitable 9.5mm drill bits and 8mm Allen Keys are available on the "ASSOCIATED ITEMS" tab of this website if required. HARD TIMBERS - Australian timber frames and imported European and American furrniture styles may be made from harder and tighter grained timbers. A simpler option to fit wooden legs in such circumstances is an Metric 8mm (M8) t/nut available as an optional extra. T/nuts have four sharp spikes that are located over the drilled hole and are driven into the underside of the wooden frame. 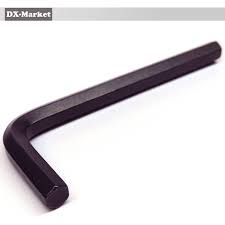 This simpler fitting is shown this website at this link Tee Nut Furniture Fasteners. Each leg has the M8 (metric 8mm) threaded bolt factory fitted. Each threaded bolt is shrouded in a plastic sleeve to help prevent damage to other legs in transit. Each wooden leg is individually wrapped in bubble wrap to help prevent damage during transit. M8 Insert Nuts for fitting to the wooden underside of chair or sofa frame are packed separately in a polybag inside the carton. Check for these before throwing out the packaging. All legs are supplied inside strong cardboard packaging.